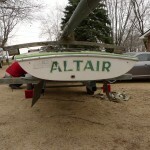 Altair’s trailer got new bearings before the long drive from Wis. to NY. Echelons of geese honked their way over the autumn fields of Wisconsin as another migration was underway a few hundred feet below. 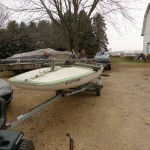 On Dec. 1, a team of “scowvengers” from Scowsailing.com picked their way across the farm fields here to glean the best M20s for rehabilitation and restoration. These boats come from farmer/dealers and boat storage owners who have agreed to unload these crazy fast boats in a state awash in crazy fast boats. Scowsailing.com snaps them up for just a few hundred dollars and then the expensive part: transport to Chautauqua NY for fiberglass work. After refitting for the asymmetrical spinnaker and some basic rehabilitation, the investment in each boat will run between $1900 and $2800. Looking at these boats can be an archaeological exercise as we search the hull for numbers and other clues that indicate the age of the vessel. Our team was led by Eric Hall, accompanied by his sailing friend Jerry Plachotnik, both of Chautauqua. I flew in from Washington DC. I20 fleets are being incubated in both regions. Surprisingly nice brightwork on this 1968. The first of three boats secured on this trip was a classic 1968 M20 with tan highlights and a white hull. 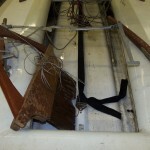 This boat sports a gold Proctor spar that will be swapped out with a better replacement. It has serviceable Melges sails. There were a number of details we did not expect. On the port side under the foredeck is a bracket for a wooden drawer. We have not seen these drawers in M20s before, although they are often seen on M16s. The boat also has a stiff deck and hull, with very little sign of balsa core. It is possible these early hulls were not laid up with the balsa cores that often get waterlogged adding uncompetitive weight. The board horns on this boat swing above deck when the boards are manipulated. The condition of the glass on this boat is amazing. A pre-columbian prize of sorts. A very racy red hull on this classic 1972. Super stiff deck. A 1972 M20 waited for us on the outskirts of Lake Geneva, where it was abandoned at a boat storage facility. This boat comes with silver Proctor spar and no sails. Combing is gone and the traveler brightwork looks like it needs to be replace. But there was good news about this boat. 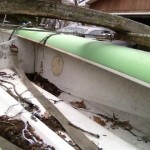 The decks are very stiff and the hull shows no sign of deterioration or water damage. The protective rub rail along the gunwale is hardly scuffed, which can sometimes mean light use. It can also mean the rub rail was replaced after heavy wear. We think this boat has legs. Like the 1968 hull, it sports a central winch behind the mastwell and board horns that swing above deck. 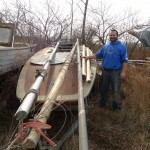 The booms and masts on the deck of the boat were salvaged from a parts barn a few yards away. 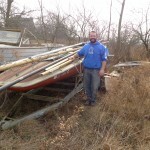 We also pulled boards from a scow that could not be saved…but will help to restore another worthy scow. Finally, there is Altair. 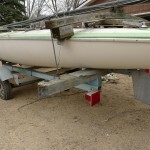 This was a well-cared-for scow that hails from Williams Bay, a boat club on Lake Geneva, home of the Melges Boatworks. The deck on the 1975 has popsicle green trim work and a pristine white hull. The cockpit was filled with leaves when we found it, but the decks were stiff and everything seemed aligned for a terrific restoration. Board horns swing below the decks on Altair and it has the modern jib travelers. Needs sails and boom, but we have plans for bringing these to the boat. Perhaps the most fascinating features on Altair are four what appear to be factory-installed, integrate floatation cells behind the mid-cockpit bulkhead, as well as port and starboard of the mastwell. These will surely keep the boat afloat, and they have access ports. 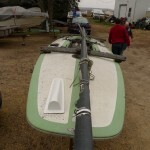 Eric and Jerry packed the bearings on the boat trailer and carefully tied down the pristine black Melges mast. 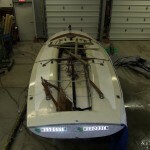 This boat may have moss and lichen on the mohogany tillers, but the fiberglass is perfect. 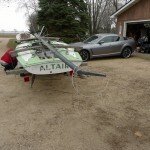 It’s no wonder we saw so many Melges boats here in the southern parts of Wisconsin. 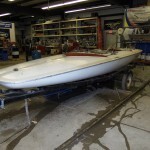 Lake Geneva is home to Melges Boatworks. 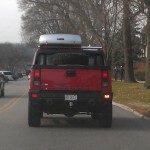 As fate would have it, one of the Melges company cars pulled in front of us as we traversed the town of Lake Geneva. We won’t get into the politics of the Melges brand; we appreciate their contribution to the sport. But we also know that introducing the I20 to new regions will take innovative marketing. It will also require more guerilla raids to scow country and the late-night renovations that follow. Jerry, Eric and I were giddy as we packed up for our separate trips home. Like sugar plums, we had visions of 40-year old boats with asymmetrical chutes dancing in out heads. 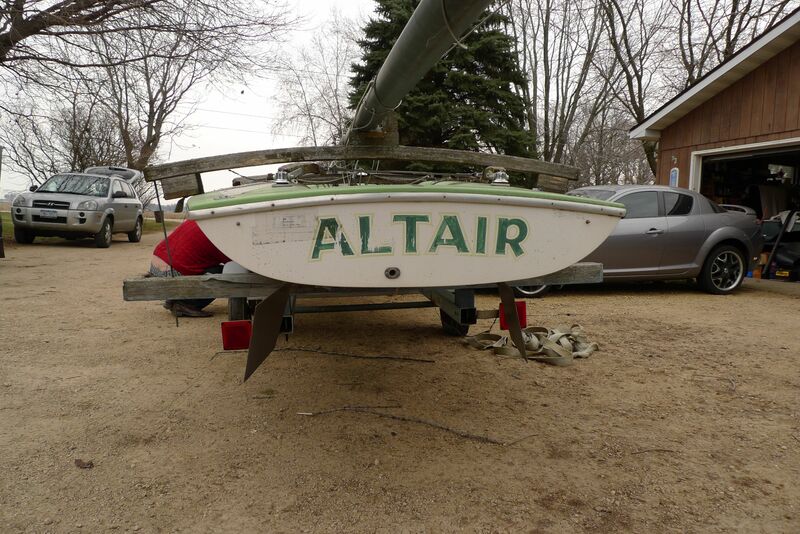 Super clean hull on Altair. We will be doing some research on who owned Altair. Lots of leaves, but very clean under it all.